Hello to everyone from Ecuador. I have just returned from finishing Aechmea zebrina bromeliad survey work along the road from Tena to La Comuna de Los Rios in Napo province. This road follows the east side of the Napo River and was built about 20 years ago. In that time the area has seen a lot more colonization and development although it is still somewhat remote. It is interesting to note that two protected forest areas bisected by this road are where I found the greatest number of trees with bromeliads. 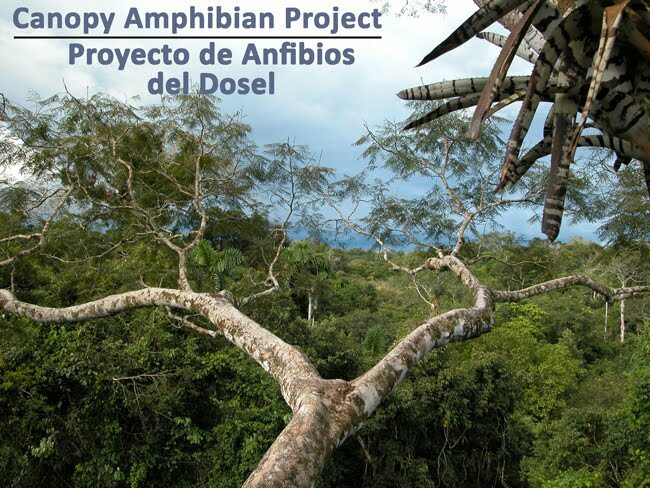 Leaving for the Tiputini Biodiversity Station tomorrow to finish things up there and install the new weather station that TADPOLE was able to purchase with donations from people like you! Many years ago there was a weather station at TBS that provide invaluable data for many researchers and it has been missed greatly. This station will help restore long-term weather data collection at one of the most (if not the most) biologically diverse spots on the planet. I will provide more details in the next few days. Take a look at the video below to get an idea of what it was like along the road from Tena. Researchers with the TADPOLE Organization contributed to a new study published this week in the journal PLoS ONE. The study finds that Yasuni National Park in Ecuador is home to the most diverse array of plants and animals in South America and possibly the planet. - "The 150 amphibian species documented to date throughout Yasuni; is a world record for an area of this size," said Shawn McCracken of TADPOLE and Texas State University. "There are more species of frogs and toads within Yasuni; than are native to the United States and Canada combined."